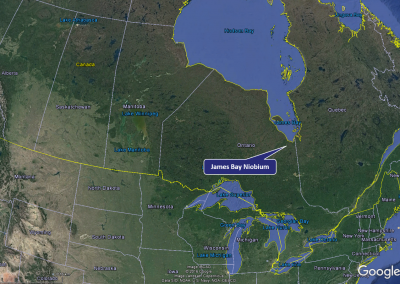 The James Bay property is located east of the Township of Carroll in the district of Cochrane, 45 km south of Moosonee, in the James Bay Lowlands in the Province of Ontario, Canada . 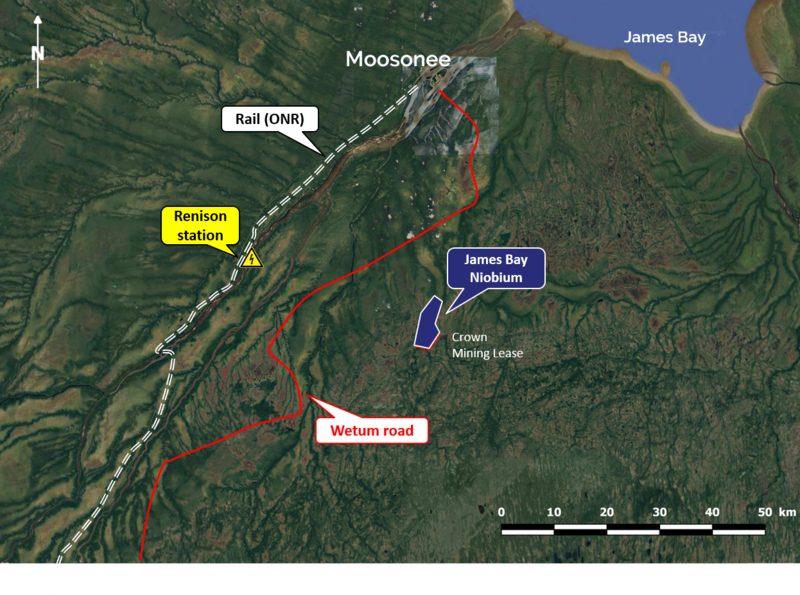 The property comprises the Crown Mining Lease and covers a total of 2,530 hectares. The James Bay property was discovered in 1966 by Consolidated Morrison Explorations. Major exploration work carried out in 1968 and 1969, including about 48,000 feet of drilling in 85 holes established a deposit extending to 900 feet in depth and 1600 feet longitudinally. Lakefield Research carried out metallurgical tests in 1969, allowing for the development of a possible flow sheet for the niobium ore, with a view to the production of a concentrate grade of about 65% pyrochlore (Nb2O5). A historical feasibility study was completed by the firm Canadian Bechtel Ltd. at the end of 1969, and updated by the same firm in 1979. A number of studies dealing with specific aspects of the project were carried out between 1969 and 1979 by independent firms or companies for evaluation purposes, with a view to possible partnerships or acquisitions. At that time niobium price was a fraction of where it is today. In June 2016, Niobay Metals Inc. acquired 100% of the property from Barrick Gold Inc., James Bay Columbium Ltd. and Goldcorp Inc.
Polychlore mineralization is contained in an intrusive complex of pyroxene-rich carbonatites dating from the Huronian Orogen and generally orientated north­ south. Intrusions of hornblende gneiss abut the complex on its east and west sides. The general dip is sub-vertical, orientated slightly to the east. Palaeozoic sediments consisting of altered, silty, sandy, argillaceous sandstones discordantly cover the carbonatite complex. These sandstones vary in thickness from 40 to 100 feet, and lie horizontally over the carbonatites, covering them completely. Unconsolidated silty glacial sediments between 20 and 30 feet deep cover these sandstones, and are themselves covered by spongy peat (muskeg) 3 to 6 feet deep. A historical estimate was finalized by Dr. P. Price of Canadian Bechtel Ltd in 1967 and indicated 62 million tonnes at 0.52% Nb2O5. 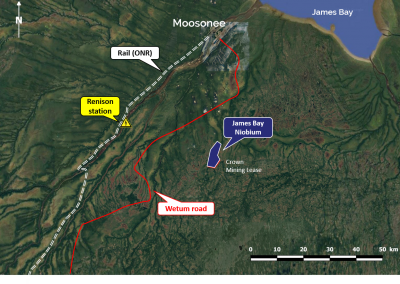 Moreover, an exploration shaft was sunk and a 225 tonne bulk sample was extracted to subsequently be used in a pilot plant which demonstrated a recovery rate of 78%, which is considered high for niobium processing. The historical resources estimate, the historical feasibility and the historical metallurgical testing are based on data obtained by previous operators in the 1960s. Niobay Metals has not yet undertaken the work necessary to verify or classify those historical results. 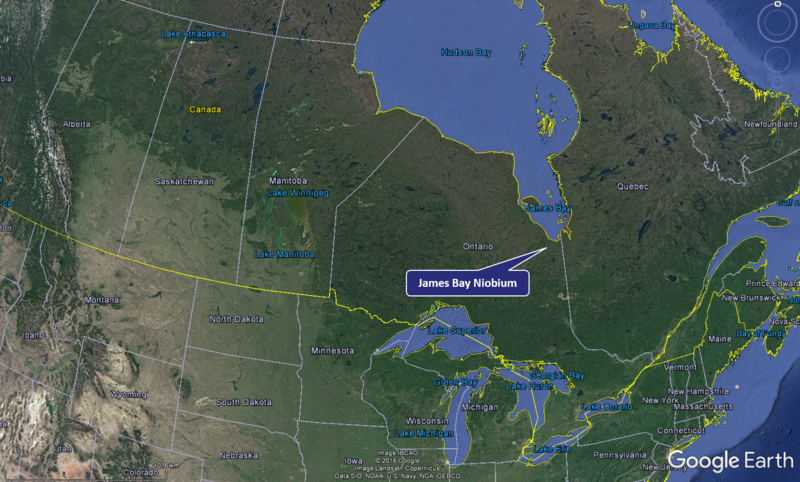 Economic studies completed in the 1960s do not mean the James Bay Niobium deposit would be found to be economic today. Niobay Metals is not treating the historical results as a current mineral resource nor as having been verified by a qualified person. 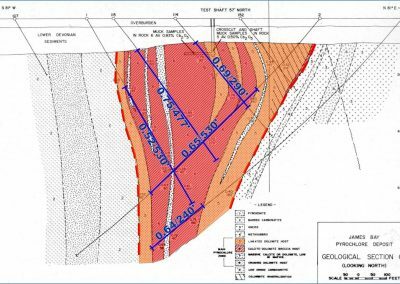 The first phase of the 2016-2017 validation program consists of re-logging and re-assaying 12 historical diamond drill holes distributed in six 400-feet apart transversal vertical sections, with two representative holes per section. A Mineral Resource estimate was prepared by Roscoe Postle Associates Inc. (“RPA”) following a successful re-logging and re-sampling program of representative historical diamond drill holes conducted by NioBay. The effective date of the estimate is October 31, 2018 and the supporting NI 43-101 technical report is available on the company website. 1. Minerals Resources are reported in metric tonnes. 2. CIM (2014) definitions were followed for Mineral Resources. 3. Mineral Resources are reported at a cut-off grade of 0.3% Nb2O5 based on an underground mining operating cost of C$70/tonne and a metallurgical recovery of 70%. 4. Mineral Resources are estimated using a long-term niobium price of US$40 per kg and a US$/C$ exchange rate of 1:1.2. 5. A tonnage factor of 10.9 ft³/ton (2.93 g/cm³) was used. 6. A minimum mining width of approximately 25 ft (7.6m) was used to build the resource wireframes. 7. Resources situated in a 150 ft (45.7m) thick crown pillar have been excluded. 8. The RPA Qualified Persons for the estimate are Dorota El Rassi, P.Eng. and Paul Chamois, P.Geo. The Mineral Resources estimate is supported by the results from the recent re-logging and re-sampling of 12 representative historical diamond drill holes, by preliminary metallurgical testing performed by SGS Lakefield on a composite sample and by all of the historical data Niobay recovered from the previous operator: drill logs, assay certificates, surveyed collar coordinates, interpreted geological surface and level plans, interpreted vertical sections, location of the exploration shaft and 1st level, and metallurgical tests. The data used to estimate the Mineral Resource include 79 diamond drill holes totalling 13,230 m located within the resource model area. The data includes 2,517 assays, of which 56 have a value of zero for Nb2O5. 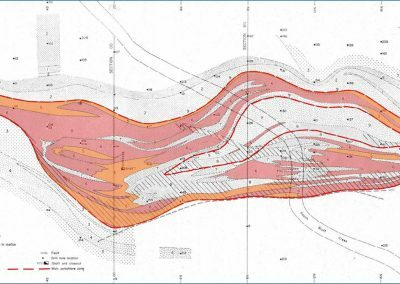 The estimate was prepared using a block model constrained with 3-D wireframes of the mineralized zone. The niobium oxide grades were interpolated using ordinary kriging and three passes.